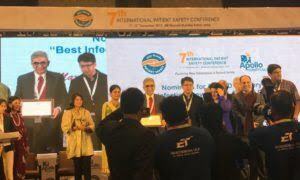 Mumbai’s Saifee Hospital has been honoured with two ‘Asian Patient Safety’ awards, which were presented at the 7th International Patient Safety Conference held recently in the city. The hospital won the awards in the ‘Best Infection Prevention’ and ‘New Dimensions Innovation in Patient Safety Practices’ categories. The conference was held to define a strategy for patient safety improvement and impart technical knowledge on various patient safety areas. “We are delighted to win this award and it is wonderful to receive recognition for the work we have been involved with. This is a testimony to our efforts taken in the field of patient care, a core focus area for Saifee Hospital. Patient care is one of the most, if not the most, important cog in the healthcare ecosystem and is a prerequisite for speedy recovery,” said a representative from Saifee Hospital. “We are honoured to receive these awards and will continue to dedicate ourselves towards providing quality healthcare for all our patients,” he added. Due to their efforts to prevent central line-related bloodstream infection in the ICU, Saifee Hospital was presented with the ‘Best Infection Prevention’ award, while the award for ‘New Dimensions Innovation in Patient Safety Practices’ was presented to them due to their constant efforts for innovation to reduce the accidental removal of non-vascular catheters. Saifee Hospital was selected from a field consisting of 43 other organisations wherein the jury received 124 nominations spread across various categories. This conference was organised by Apollo to spread the benefits of patient safety throughout the country.